Virunga National Park – Oil Exploration: On 23 September 2012, newswire reports indicated that the Minister of Hydrocarbons Crispin Atama Tabe, was considering reviewing the country’s laws which limit prospecting and exploring for minerals inside the country’s national parks. Atama Tabe stated that the DRC has the right to know what resources it has under the earth, even if it’s in the park or the forest, anywhere. Most of the controversy is around the Virunga National Park which covers a total of 7802 sq km in the Semliki and Edward Basins, in the Western Extension of the East African Rift System. The park extends from Total’s block III in the north to Soco’s Block V in the south and is one of Africa’s most biodiverse areas. Around about 200 of the world’s 700 remaining mountain gorillas inhabit the 250 sq km Mikeno Sector, in the south-east corner of the park, bordering Rwanda and Uganda. Around 85% (6610 sq km) of the park is covered by oil exploration blocks. Around 968 sq km (32%) of the park lies in Total’s Block III and Total has reported that it will focus its exploration on the northern part of the block, away from the park. Block IV (Open) covers 3,489 sq km, of which around 50% (1750 sq km) overlaps the National Park. Block V covers around 7529 sq km of which 3897 sq km (52%) overlaps the Virunga National Park. Soco’s area of interest is the lowland savannah area around Lake Edward and the lake itself around 37 km from the mountainous Mikeno Sector. 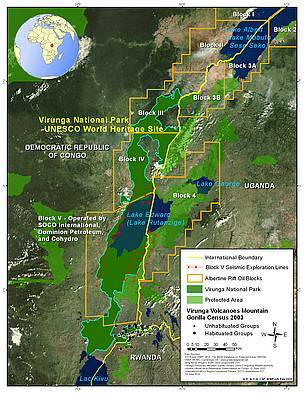 On 25 September 2012, the British Government stated that it is opposed to Soco exploring for oil in the Virunga National Park. It also urged Soco and the government of DR Congo to fully respect the international conventions to which the DRC is a signatory. Soco’s deputy chief executive officer, Roger Cagle said in a statement that the company was involved in the project at the invitation of the Congolese government and that Soco was years away from completing its research in the area and that exploration was in a preliminary phase, involving scientific studies, to assess the petroleum resource potential of the region. DrillingInfo International understands that most field operations have also been curtailed by the deterioration of security through Q1 and Q2 2012. At least nine armed militia groups were active in the park in August 2012 and there have been several attacks on park rangers, UN peace keepers and foreigners, as well as the local population. The UNHCR estimates that there are around 250,000 internally displaced people on the park boundary and their need for fuel wood, has led to widespread deforestation. In February 2011 a senior member of staff working for a security company, contracted by Soco was briefly kidnapped by forces hostile to the Government and earlier in 2012 members of the FADRC were killed by the occupants of a helicopter near Lake Kivu. In spite of the insecurities both Total and Soco have successfully engaged local communities, conducted local awareness campaigns and met with local chieftains. On 12 September 2012, newswire reports quoted that partner SacOil had reported that an airborne gravity and magnetic survey has been completed successfully over Block III. The survey ‘broadly confirmed’ the trend seen in adjacent concessions in the Albertine Graben in Uganda. Data acquisition is thought to have commenced in early August 2012. Total was initially planning to acquire an airborne FTG survey over the Block III licence area in Q4 of 2011. The data will be integrated with vintage 2D data and will form the basis for a 2D survey. Block III lies in the Albertine Graben, south of Lake Albert and the Semliki basin, in Haute Zaire province. Even though there have been several oil and gas discoveries in the Ugandan part of the Albertine Graben, the Semliki basin is far less understood and considered much higher geological risk. Since the block was awarded in 2010 there has been very limited exploration and no seismic data has been acquired to date. Total completed its initial satellite based topographic and vegetation mapping project in the second half of 2011 and used the data for a base map for its airborne geophysical survey. Total farmed into the licence covering Block III in March 2011 and interest is currently split between Total E&P RDC (66.667% + Operator), with Semliki Energy SPRL (18.333%) and CoHydro (15%). Interest in Semliki is split between SacOil Holdings Limited (68%) and DIG Oil, a subsidiary of the Divine Inspiration Group (18%). Soco was also planning to acquire an airborne gravity and magnetic survey over Block V in the Albertine Graben in 2012, using a crew based in Uganda. The aerial survey and baseline studies were commissioned through an Environmental Acceptability Certificate issued by the DRC Government in September 2011, as part of its wider strategic environmental evaluation and its work programme was agreed in close collaboration with the Congo Environmental Studies Group (GEEC) and the Congolese Wildlife Authority, Institut Congolais pour la Conservation de la Nature (ICCN). It has also engaged with international authorities concerning clarification of the permits required for an Environmental Acceptability Certificate. Depending on the results of the survey, Soco will consider seeking approval, potentially around the end of 2012, to conduct a compressed air 2D seismic survey on Lake Edward and if approved, could be acquired in 2013/2014. The compressed air seismic survey has been recommended by seismic contractors as it is not harmful to any nearby marine life and a similar seismic survey has already been conducted on Lake Edward by another operator. Soco was also planning to acquire environmental baseline studies which include an inventory of hippopotami, ichthyological studies and malacology studies on Lake Edward prior to conducting an aerial survey over Lake Edward and the adjacent lowland savannah in 2012. Following the withdrawal of Ophir Energy in July 2012, interest in Block V has been split between Soco International (85%) and CoHydro (15%). Soco may be interested in farming out interests prior to drilling.